Unless something unexpected happens, Justin Fields will succeed Dwayne Haskins as Ohio State’s quarterback this fall. But without Haskins, Fields almost certainly would not even be in Columbus. Fields, who spent last season backing up Jake Fromm at Georgia, watched from the bench as Haskins threw more touchdown passes (50) than he had pass attempts (37). He saw Dwayne Haskins set the records for single-season passing record (4,831 yards) and single-season passing touchdowns (50), while also setting countless Ohio State records in his first year as a starter. When Fields determined he would transfer from Georgia, he already had his eyes on the Buckeyes. Haskins, running the offense put together by first-time head coach Ryan Day, had the season he hopes to have. In order to come close to replicating the historic season Haskins put together, Fields had a notable obstacle to overcome. He had to apply for a waiver to play immediately. Otherwise, he would have to sit out the 2019 season. Friday evening, Ohio State made the long-awaited announcement. Fields is eligible to play this fall without sitting out any games. On Wednesday, both Fields and Day gave off a sense of cautious optimism about the probability of the waiver getting approved. They knew that was the most likely outcome, but it’s never an optimal position for someone else to hold the fate of your quarterback in their hands. Ohio State doesn’t have to worry about that anymore. Its attention can fully turn toward preparing Fields to become the Week 1 starting quarterback. Fields didn’t choose to be a Buckeye to sit, and Day didn’t recruit him with the intention of putting him on the bench. He took the road up to Columbus for Day to develop him into a top NFL draft pick, just like he did with Haskins. Only two other scholarship quarterbacks are on Ohio State’s roster. Matthew Baldwin will be in his second year in the program and didn’t return to full health until late this past fall after suffering a torn ACL in December 2017. Chris Chugunov, a redshirt senior, was brought to the team as a graduate transfer from West Virginia last year for depth purposes. He isn’t ever expected to see the field. Hypothetically, Baldwin has a chance to win the job. Day will almost assuredly not announce a quarterback decision early in the spring, in order to maintain a healthy competition. But it’s hard to imagine Fields not winning the starting job. 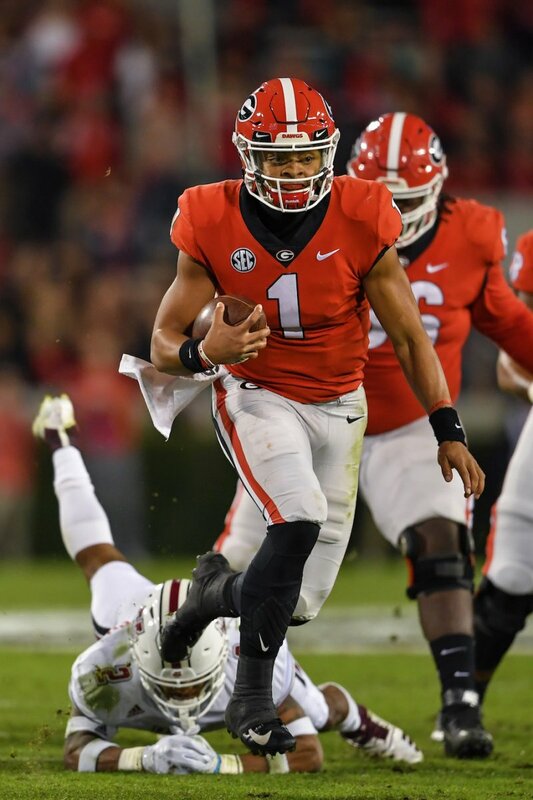 Fields entered Georgia as a five-star quarterback – only Clemson’s Trevor Lawrence was ranked higher in the 2018 recruiting class – and won the 2017 Elite 11 MVP award. He’s the highest rated recruit to ever play for Ohio State, surpassing Terrelle Pryor. The 6-foot-3, 225-pound signal-caller already has the size of a starting college quarterback. “The film that I've looked at, I think he's very dynamic,” new quarterbacks coach and passing game coordinator Mike Yurcich said on Wednesday. Fields pairs a high-level arm that also garnered interest from MLB scouts with a 4.51-second 40-yard dash. Day would prefer not to use the transfer portal to find Ohio State’s next quarterback. But with the addition of Fields, Ohio State maneuvered the portal to perfection and landed who will likely be its starting quarterback in the fall. If there was any noteworthy concern about the waiver passing, neither Fields nor Day never showed it. But the possibility of Fields not being able to play immediately hung over the program. A worst-case scenario with only Baldwin and Chugunov eligible to play in the fall seemed in play. Ohio State’s announcement of the waiver succeeding on Friday sets the team up with an enviable succession plan. Fields might not be Haskins, at least not right away, but he certainly has the abilities to be special in Day’s offense.